Roasted garlic Brussels sprouts may be one of my favorite cooked vegan dishes. The crispy and crunchy leaves with the soft and sweet center is just an incredible combination. So I made raw vegan smoky garlic Brussels sprouts, a raw vegan version inspired by the cooked counterpart. I couldn’t achieve it exactly but I got the overall feel by using the dehydrator. The dehydrator will dry the leaves crispy, similar to the crispiness you get from roasting. If you don’t own a dehydrator, they taste great raw as a salad. It is not quite the same, but still very tasty! 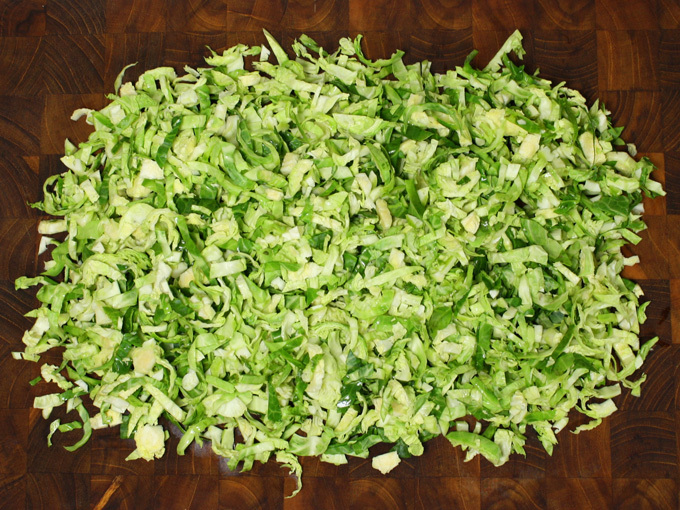 To prepare, wash the Brussels sprouts and cut them in half, lengthwise. Cut out the core using a “V” cut, then thinly slice the leaves. If you are going to use a dehydrator, slice it into 1/4 inch thickness strips so that it’s not too thin. If you slice it too thin, the dehydrator will shrivel it up too much. Transfer the shredded leaves into a bowl, and add olive oil, salt, pepper, garlic powder and liquid smoke. If you are not using a dehydrator, squeeze a little lemon juice in too. Massage the leaves well with your hand. If you don’t own a dehydrator, plate the leaves and top with some chopped almonds. I recommend sprinkling a generous amount of nutritional yeast and some coconut bacon for an extra burst of flavor. If you own a dehydrator, line the tray with a mesh sheet, then a silicone sheet. Spread the leaves thinly and evenly. Put the tray in the dehydrator and dry on 115℉ (46℃) for about 3 hours, until the leaves become crispy. Once they dry, the garlic flavor tends to disappear so if necessary, sprinkle a little more garlic powder and toss well. 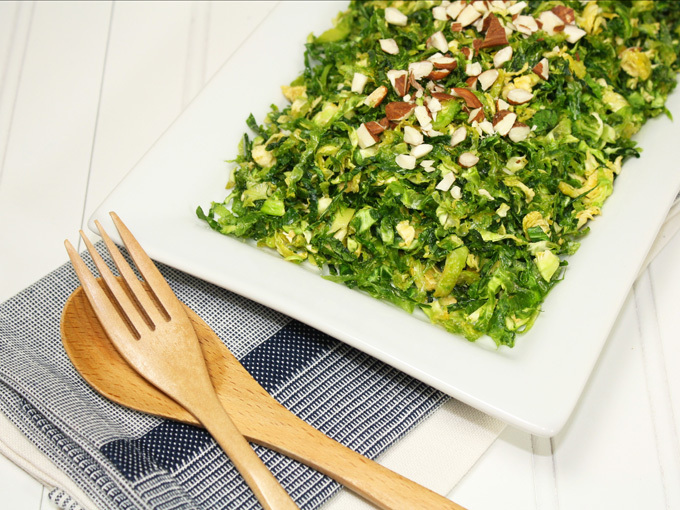 Plate the Brussels sprouts, and top with some chopped almonds, then dig in! It’s crispy and crunchy and almost like a potato chip. . . Well, okay maybe not exactly like a potato chip but it’s still really good. A great side dish, salad or snack even. Enjoy! 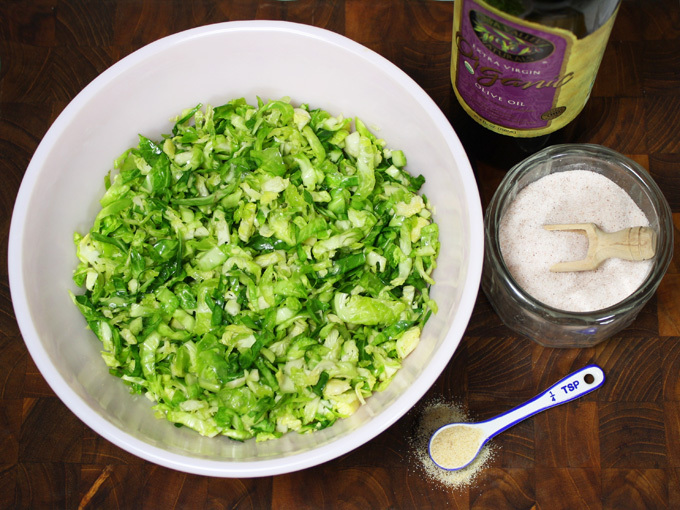 Wash the Brussels sprouts and cut them in half, lengthwise. Cut out the core using a "V" cut, then thinly slice the leaves. If you are going to use a dehydrator, slice it into ¼ inch thickness strips so that it's not too thin. 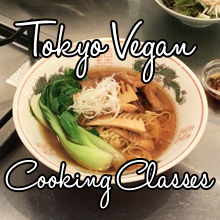 Transfer the shredded leaves into a bowl, and add olive oil, salt, pepper, garlic powder and liquid smoke. If you are not using a dehydrator, squeeze in the lemon juice in too. Massage the leaves well with your hand. If you don't own a dehydrator, plate the leaves and top with some chopped almonds. 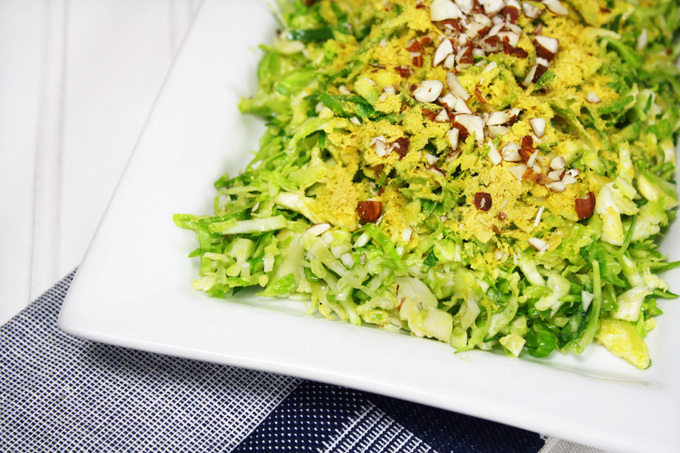 Sprinkle a generous amount of nutritional yeast and some coconut bacon for an extra burst of flavor. If you own a dehydrator, line the tray with a mesh sheet, then a silicone sheet. Spread the leaves thinly and evenly. Put the tray in the dehydrator and dry on 115℉ (46℃) for about 3 hours, until the leaves become crispy. Once they dry, the garlic flavor tends to disappear so if necessary, sprinkle a little more garlic powder and toss well. Taste test and salt to taste. 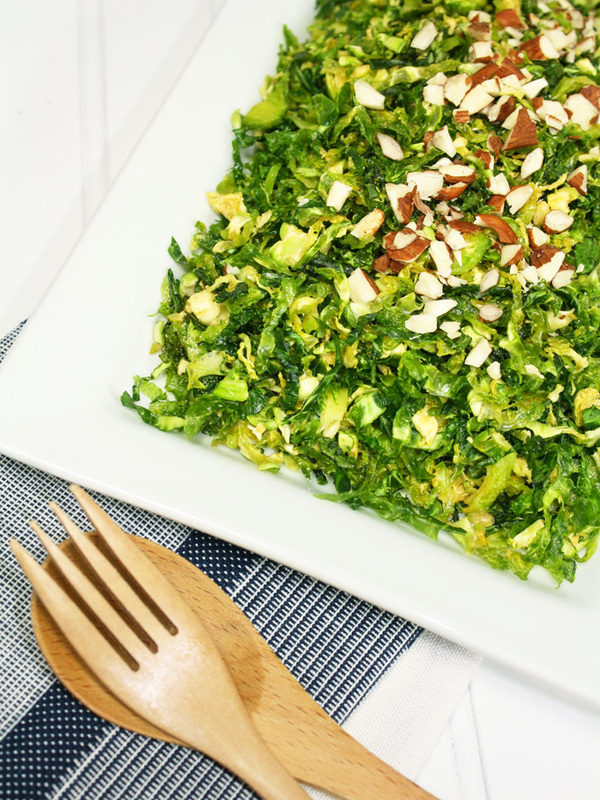 Plate the Brussels sprouts, and top with some chopped almonds.